Every Thursday morning I would be on the Aramco bus to Khobar like clockwork. Even the bus was an adventure because you would meet people from all over the world -- Azerbaijan, Lebanon, Malaysia -- and could strike up an immediate and fascinating conversation. Those dusty streets were forever fascinating to me and I would follow pretty much the same route each week. Latif Bakery and its fabulous zaatar/cheese bread would make a great breakfast; even the aroma of the bread was wonderful and the place was always packed. 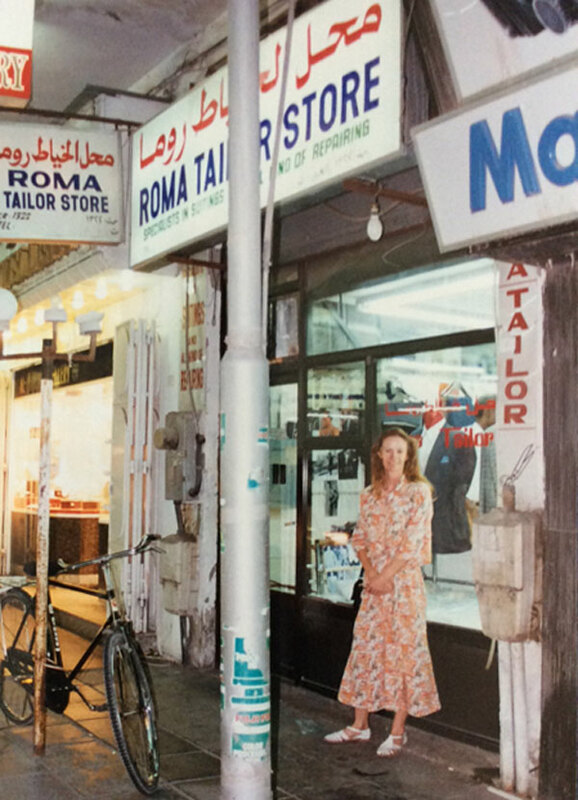 Roma and OK tailor became like part of my big Khobar family; some things came out wonky but I still kept going back. Bags of sewing were piled high up the walls and yet he could always find your item, (ha?!! ) The shoe-mender, you would walk into a cloud of glue fumes (wheeze); he also had that haphazard method of storing your shoes but could always find them; in fact sometimes I would walk by and he would wave to me saying I had left my shoes weeks earlier! The tiny Asian supermarkets had that familiar spice aroma and I would wander the aisles looking for special ethnic treats; when I told the Indian assistant I was looking for male eggplant he cracked up laughing. Walking into the Afghani rug shop to say hello to Abdul Rasool, the wonderful smell of the carpets; I could spend days looking at those; the tribal rugs all tell a story and it is quite lovely to think I have many now in my house that link me back to that special place. The fresh juice shops were fantastic and yet another treat on my wanderings; sometimes a shopkeeper even had pomegranate or mango. 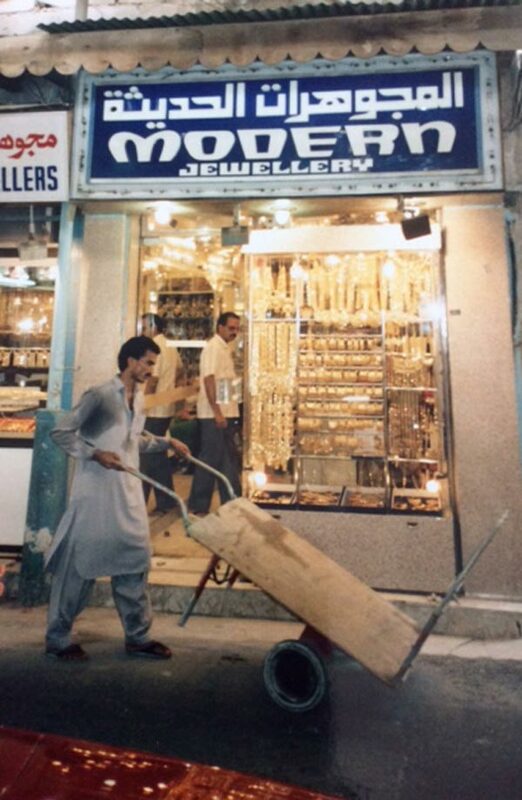 The Yemeni gold shopkeepers would all wave to me as I went by, it was always quite surreal to go in there with a broken bit of gold and come out with a stack of cash. Desert Design had such a flair for display and sourcing beautiful things. Even the kitchen shops were interesting! Kashmiri, Korean and Iranian shops made for a wonderfully eclectic mix and endless treasures. Along the way, of course, you got to know the shopkeepers and unwittingly followed them through their lives until they got old. ‘Ray Charles’ in his dark glasses floating through his kitchen shop, OK tailor smirking when I asked him for the 50th time where my silk shirt had gone (what silk shirt?! ), the clock man with his squawking chicken clocks and wailing prayer clocks; they were all a quirky delight; it was a kind of entertainment, its own movie. Bartering was a wonderful game and part of the whole shopping adventure, especially in the carpet shops. Time was spent sipping tea and playing that game. Wow what a place; as time went by and more and more shopping malls swallowed up the world, I knew even more how special Khobar was. 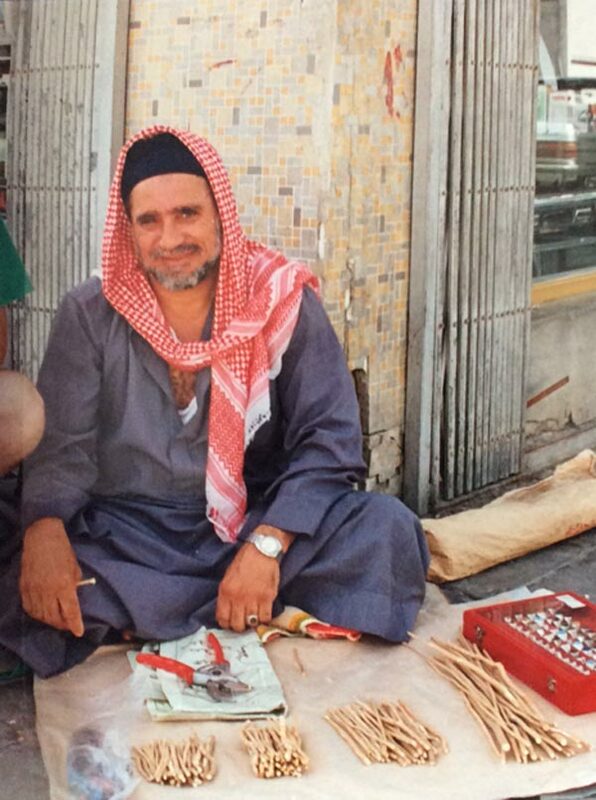 Sometimes I would wander up to ladies street (Bandar), stopping at Bayouni Coffee on the way; you would practically drown in the aroma of coffee but it was fantastic; those old guys were delightful and had been there forever. We were horrified when they replaced their lovely old wooden counter with new shining plastic. Drifting by Salahuddin with his lovely pyramid displays of sweets; I don’t even like sweets but I would end up inside anyway. 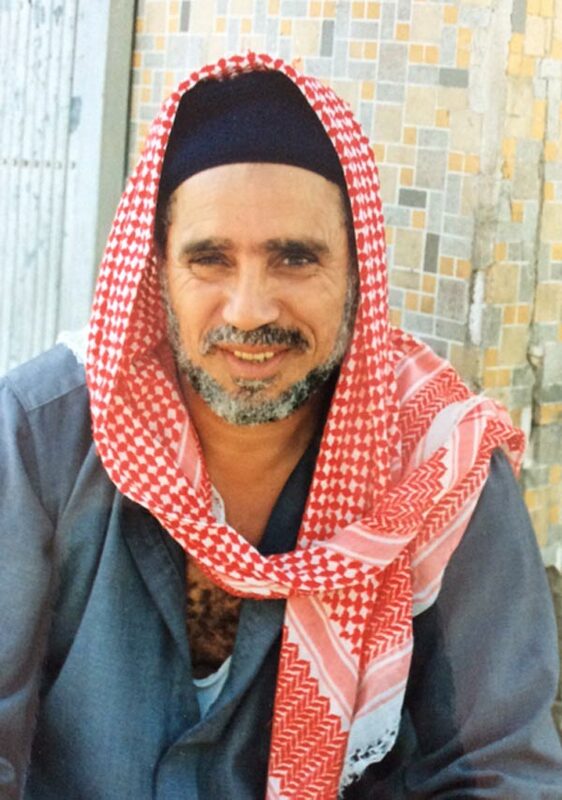 He was always welcoming and would let me taste his delicious pistachio maamoul and sesame cookies. 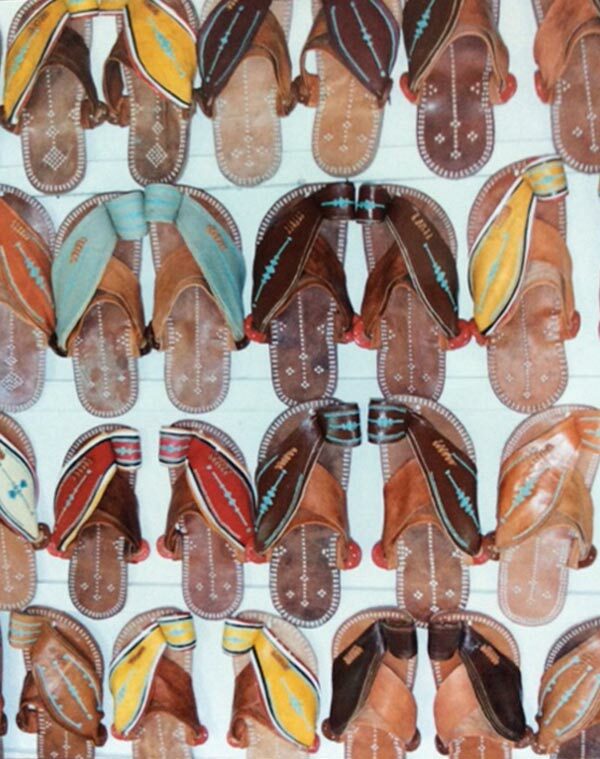 Bandar would take you into that world of fabulous fabrics from all over the world. If you walked into an abaya shop you were kind of sucked into a black hole because everything was black! Even the abaya has evolved to designer status now and can cost a fortune with tailors adding special embroidery onto the sleeves. Amazing evolution as the original one was shaped like an eggplant and had as much fabric as a parachute (trip). Pepsi Road was a bit of a trek and opened up more upmarket shops as well as the wonky and dusty souvenir store with its acres of oriental china and al Amri bakery, the shopkeeper who rolled his zaatar like a giant cigar; both were addictive! Abdulaziz Blvd. had the most bizarre restaurant we called the shower curtain place because the cubicles were separated by shower curtains and the waiter would rip them open like in the psycho movie; the best mutabal could be found there. So much about Middle Eastern food I learned there, kind of by osmosis. It was all fascinating but perhaps I loved the days where I had nothing special to look for the most because then I could just meander and find other things in the alleyways and tiny shops; all manner of exotica could be found there; it was never boring. And speaking of not boring, nighttime shopping during Ramadhan was a heady experience; forget the daytime because everyone was wrecked and fasting, but nighttimes were a kaleidoscope on life; so much color, laughter, food, noise; I remember the lovely old man who sat on the street corner selling tooth sticks made of soft wood. Something about shopping at 1am, floating across 3 lanes of traffic in a cab, yes it was all that heady mix of the bizarre and the exotic; I loved it all! Al Raji money exchange, that place was always jam-packed and heaving. The amount of cash in Khobar was staggering; it was a cash society and people would often carry wads of it around in brown paper bags. The charm of this was we always felt safe and I would often wander the streets of Khobar at night quite happily, but maybe I would not do that here in England. On the other hand, there were masses of tripping hazards and holes in the pavement, and one day I walked into an AC unit hanging low off a wall (clunk!). If I was there in the evening, I loved the shawarma with tons of hot sauce, and the Thai-house restaurant with its fiery basil rice and tom yum soup; that mix of fantastic food and weird surroundings was irresistible. Even buying something as boring as insurance could turn into an amusing interlude; Ghurmalla checked my form, looked up suddenly and said: “What is your star sign? Mine is the same as Tom Cruise.” (!!!) I burst out laughing and we veered off into the most ridiculous and entertaining conversation. I would follow Latif Bakery street towards Tamimi Safeway, stopping at the wonderful fruit and vegetable shop en route. The shopkeeper had some great things but if the old Pakistani guy was on the till...somehow he did not like me (no abaya!) and jacked the price up to double! It was hilarious; one time I took a red bell pepper and he said 9 Riyals, I said oh never mind, he said OK 6! I walked away and he said 4! Does he wonder now where I have gone? He called me "tomatoes" because I always bought so many. Walking around was great because you would notice so much; somewhere down there was a weird bus stop with buses coming from other parts of the Middle East; one day a lady got off the bus; she looked maybe Omani and was wrapped in the most beautiful electric blue fabric, wearing silver shoes; she looked incredible against those dusty streets and battered buildings. Thursday morning was also a social occasion because the diehard regulars were always there too; each having their own route and focus. Summertime was more of a challenge with the heat but even so, it was do-able if you collapsed all afternoon when you got home! Yes, I’ve done that many times. Onto Safeway and their wonderful spice bins; brilliant colors like the purple sumac and bright red chili, different zaatars from all over the Mid East, giant Indian cashews, huge dried fruit and nut collections and fantastic Lebanese and Syrian olives; all I can say is wow, there is nothing like that here. On my way out I would buy the spinach pie from their bakery and the baker was Syrian, so would put pomegranate seeds and walnuts in it too; delicious. There used to be an Iraqi Food store but they changed their name during the Gulf War to Pinar and sold great olives and all types of weird cheeses floating in water. Jameel, the household shop, sucked you into buying an array of woks and cooking dishes that maybe you did not even need. There were so many delights; Oh, I forgot to mention the Yemeni souk that sold the dizzying array of Haj towels and ghutrahs, and the great ‘antique’ shops where they would always remember you even if you had not been in there for 10 years! When I arrived I had a gold name necklace made; about 20 years later I was walking down King Khaled street and a voice said, “Hello, Jacqueline”!!! He remembered me and yet I had not been back to his shop all that time, that is how special a place it is; sigh, sigh! Khobar is a delight and yes, perhaps I left a piece of my heart there as well!